DexCom, Inc. (DXCM): "Sugar High" - Competition With Abbott's Libre 2? DexCom, Inc. (DXCM): “Sugar High” – Competition With Abbott’s Libre 2? Spruce Point is pleased to issue a unique investment research report on Dexcom, Inc. (“Dexcom,” “DXCM,” or “the Company”) a manufacturer of continuous glucose monitoring systems (“CGMs”) for diabetic patients – with 45-60% downside (approx $65 – $85 per share). 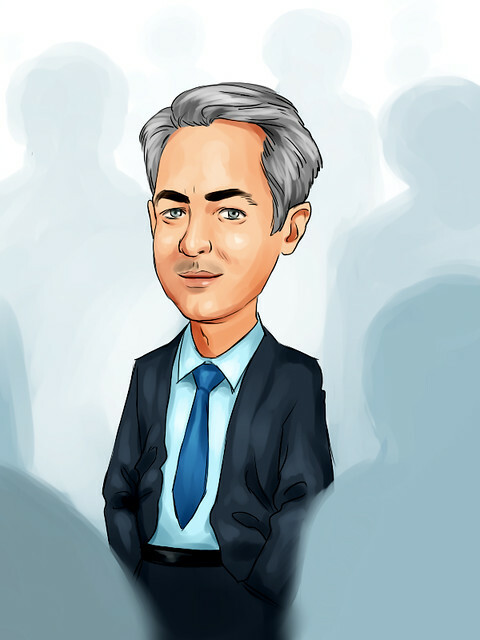 Spruce Point Sees 45-60% Near-Term Downside Risk In Dexcom (NASDAQ: DXCM): $65-$85 Per Share. Longer-Term Tail Risk Even More Significant. Dexcom, Inc. (“Dexcom,” “DXCM,” or “the Company”) manufactures continuous glucose monitoring systems (“CGMs”) for diabetic patients. It competes with Abbott’s FreeStyle Libre in the stand-alone CGM space. Dexcom’s G-Series has until now been considered the gold standard, with the Libre a cheaper, user-friendly alternative. However, Abbott is set to release the Libre 2 in the U.S. imminently – in a matter of weeks or months, we believe – and will close most, if not all, of the technological gaps which separate it from Dexcom’s G-Series. CGM commoditization will promote heavy price competition – and Abbott, as the low-cost manufacturer by a factor of 4, can put heavy pressure on Dexcom profits with little downside to its own margins. The Street believes that the down-market Libre is not a serious threat to Dexcom’s market, but the Libre has taken >70% incremental share of the U.S. Type 1 (“T1”) market and >95% incremental share of the U.S. Type 2 (“T2”) market since first being released in the U.S. – even before the release of the more advanced Libre 2. 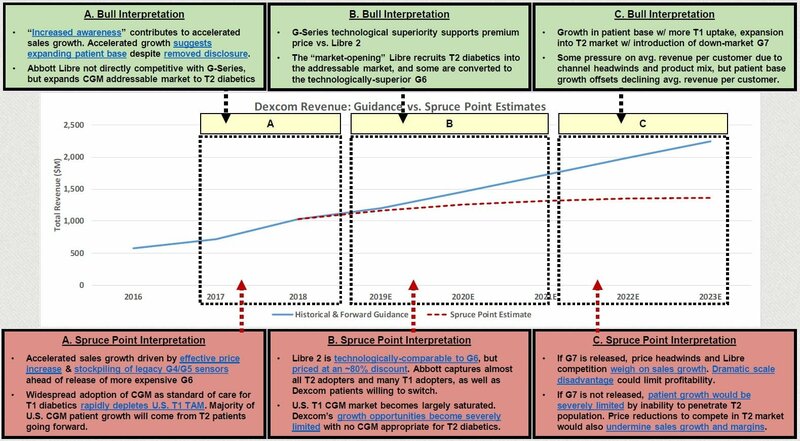 We believe that the G6’s target U.S. T1 market offers just 1-2 years of remaining patient growth, severely restricting Dexcom’s patient base until the release of the T2-oriented G7 in late 2020-21 at earliest. Importantly, we also find evidence that Dexcom’s recent sales growth acceleration was driven by an effective price increase and stockpiling of cheaper legacy G-Series models – and is not an indication of recent patient growth (which management conveniently stopped disclosing). Dexcom Has Few Avenues To Near-Term Patient Growth: S. T2 patients did not adopt CGMs in material size until the release of the far cheaper Libre 1. Abbott is now taking >95% incremental share of U.S. T2 patients, suggesting that T2 patients may have never been part of the G-Series TAM. Dexcom will effectively be locked out of the T2 market until it releases a cheaper, down-market CGM similar to the Libre (late 2020-21 at earliest, per management, after having failed to meet its initial target of 2018). Libre is also taking >70% incremental share of U.S. T1 patients, even before the technologically-comparable Libre 2 hits the market. With the U.S. T1 market already ~50% penetrated (with a likely ceiling of 70-80%), Dexcom has limited room for patient growth through the next 1-3 years as T1 patient adoption decelerates, as it competes against the cheap yet technologically-comparable Libre 2 in its core T1 market, and as it fails to make significant headway in the T2 market – by far the largest source of CGM patient growth through FY19-21 and beyond. A Risky One-Product Company Valued As A Growth Story: DXCM is valued at a 57% premium to peers on its seemingly exciting growth story despite exposure to competition / TAM Even bullish sell-side analysts see only ~5% upside, and smart money seems to be wary of DXCM’s growth prospects. We see 45-60% near-term downside in DXCM shares on disappointing sales growth and a multiple rerating, and even more potential future downside on longer-term price pressure. The market interprets Dexcom’s recent blow-out sales growth as proof that the bull case is playing out: as T1 and insulin-dependent T2 diabetics increasingly embrace CGMs as the future of diabetes care, Dexcom is in position to benefit as the provider of the gold-standard stand-alone CGM. However, we believe that recent sales growth offers a false image of patient base growth, and that Dexcom’s patient growth opportunity will be severely limited over the coming ~18 months at the very least. Until now, Dexcom has been the only true stand-alone CGM with a high/low glucose alarm – a critical feature for T1 and some ID T2 diabetics. However, the forthcoming Libre 2 from Abbott will also have this feature, in addition to an accuracy level comparable to that of the G6 – all while being priced at an ~80% discount. We believe that this – combined with the fact that G6 are still searching for ways to extend the lives of their sensors, as they did with the G5 – will encourage widespread adoption of the cheaper Libre 2 among T1 and T2 diabetics, particularly since the remaining population of unpenetrated T1 and ID T2 diabetics must represent the most price-sensitive segment of the addressable population. Unless it cuts the price of the G6 heavily (which it may not have the capacity to do), Dexcom’s remaining growth runway will be severely limited. If, per our survey, 70% of G5 users were willing to assume the risks involved in hacking their transmitters for the sake of 33% annual cost savings, we suspect that a material proportion of Dexcom G-Series users will be willing to switch to the now-comparable Libre 2 for the sake of over 80% annual cost savings. U.S. market opportunity lies among T2 customers, who appear to be untouchable by Dexcom at the G-Series’ current price point. Had Dexcom moved faster to produce a CGM fit for the T2 market, management’s patient growth expectations for FY19 and FY20 would look more realistic (though a shift in mix to a down-market CGM would weigh on average revenue per patient and, therefore, sales growth). However, with management having failed to come to market with its down-market product as originally scheduled, it has nothing with which to bridge the gap between FY18 – the last year in which the G-Series was effectively free of competition in the increasingly-saturated T1 CGM market – and FY21 – the first year in which it might have had a CGM capable of competing with the Libre on a broader basis. For at least ~18 months, Dexcom will be dramatically outpriced by the Libre 2 in its (dwindling) core T1 market, and will effectively be incapable of making material headway into the expanding T2 market, severely limiting the Company’s near-term growth opportunity and setting it back in the nascent T2 market. 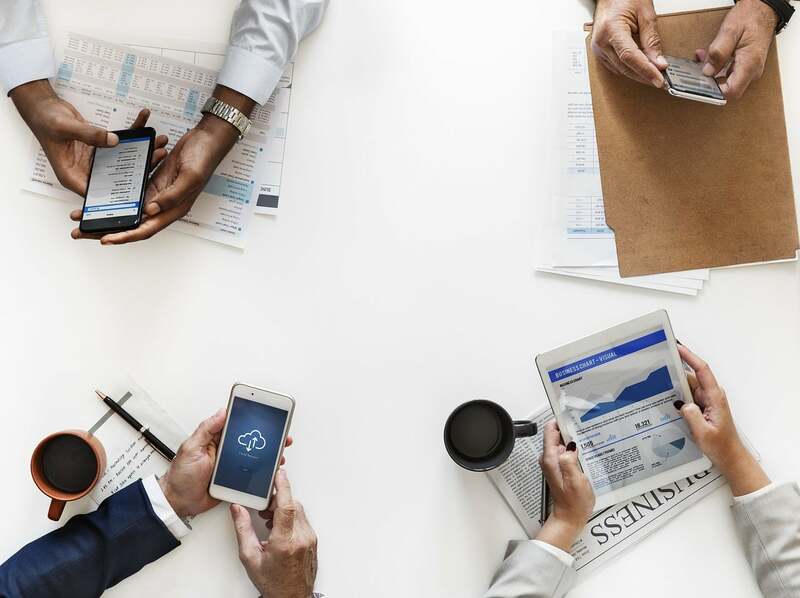 The market interprets Dexcom’s recent sales growth acceleration as proof that the bull case is playing out, and that it has been growing its patient base at a healthy rate. However, we believe that the decoupling of sensor sales growth from transmitter sales growth suggests otherwise. Our diligence reveals that a significant share of G4 and G5 users “hack” their sensors to extend their usable lives by an average of ~70%. The unhackable G6 forces users to purchase sensors more frequently, forcing an effective ~56% sensor price increase on Dexcom CGM users on a cost-per-day basis. Our diligence also reveals that many G4 and G5 users stockpiled “cheaper” legacy sensors ahead of the commercialization of the G6 in Q2 FY18, thus accelerating sensor sales growth in Q2. Sensor sales growth (and total revenue growth) should rerate to a lower normalized level once the effective price increase lapses in Q2 FY19. Meanwhile, slower transmitter sales growth is a more accurate indicator of underlying patient base growth of late (yet itself is likely inflated by accelerated transmitter purchases around the time of the release of the new G6).